Heart valves are composed of multilayered tissues that contain a population of vascular endothelial cells (VEC) on the blood contacting surfaces and valve interstitial cells (VIC) in the bulk tissue mass that maintain homeostasis and respond to injury. 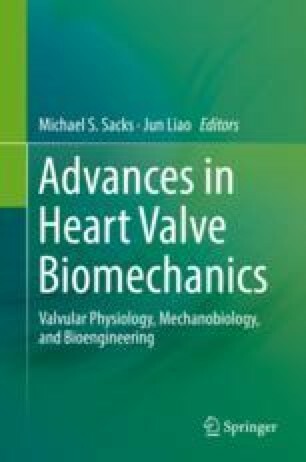 The mechanosensitive nature of VICs facilitates the regulation of growth and remodeling of heart valve leaflets throughout different stages of life. However, pathological phenomenon such as mitral valve regurgitation and calcific aortic valve disease lead to pathological micromechanical environments. Such scenarios highlight the importance of studying the mechanobiology of VICs to better understand their mechanical and biosynthetic behavior. In the present chapter, we review use of novel experimental-computational techniques to link VIC biosynthetic response to changes in in vivo deformation in health and disease. In addition, we discuss the development of tissue-level models that shed light on the biomechanical state of VICs in situ. To conclude, we outline future directions for heart valve mechanobiology including model-driven experiments and highlight the need for high-fidelity, multi-scale models to link the cell-, tissue-, and organ-level events of heart valve growth and remodeling. This work was supported by the National Institutes of Health (NIH) Grants R01HL119297. CHL was in part supported by start-up funds from the School of Aerospace and Mechanical Engineering (AME) at the University of Oklahoma, and the American Heart Association Scientist Development Grant Award (16SDG27760143).